Consumption Patterns in Eastern and Western Europe discusses the consumption tendencies in Czechoslovakia, France, the German Democratic Republic, Hungary, Italy, Poland, the Soviet Union, and Switzerland. The topics discussed include the nomenclature of goods and services; accounting framework and analytical tables; enlarged consumption and national income; and structure of social consumption funds according to the form of allocation to beneficiaries. The market and non-market forms of enlarged consumption; financing of collective funds by households; structure of enlarged consumption; and forms of financing enlarged consumption are also described in this text. 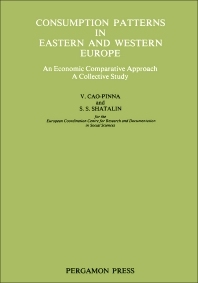 This book is beneficial to students and individuals interested in the resource allocation practices of countries in Eastern and Western Europe. Chapter 2. A Comparative Study of the Structure and Development of Enlarged Consumption in Czechoslovakia, German Democratic Republic, Hungary, Poland and U.S.S.R. Appendix B. Basic Tables B1-B3 of C.S.S.R., G.D.R., Hungary, Switzerland and the U.S.S.R.